Considered as one of the best strikers in the world, Samuel Eto’o has officially joined the Supreme Committee for Delivery & Legacy (SC) as a Global Ambassador. The former Cameroon international, Eto’o secured 15 major accolades in his glittering career to-date comprising three Union of European Football Associations (UEFA) Champions League victories, four league titles across spells in Italy and Spain, and one FIFA Club World Cup, reported Gulf Times. The footballer follows Xavi Hernandez and Mohamed Saadon Al Kuwari who earlier joined SC as the committee’s official Global Ambassadors. Eto’o has also earned 118 international caps as well as been part of four FIFA World Cups between 1998 and 2014. He joined QNB Stars League side Qatar Sports Club and made a new home for himself in the host country of the next FIFA World Cup in August last year. 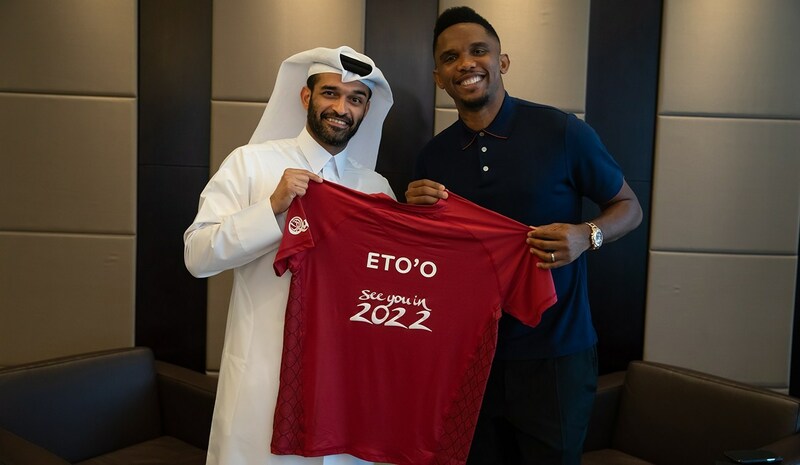 Eto’o was officially welcomed as a part of the journey to 2022 in a special signing ceremony, which saw the participation of SC Secretary-General Hassan Al Thawadi. “It’s a great honour for me to be an ambassador for the SC and hope I am able to deliver what is expected of me. The World Cup is the biggest competition in football – there is nothing bigger – and I think that for the players who have had the chance to play in the World Cup there is nothing more beautiful,” the four-time African Player of Year commented. “Football goes much farther than politics and it’s important that football travels the world because it’s everywhere – it’s an incredible social force,” he underlined, according to a press release issued by SC. “It has an impact on our lives even if some do not like football – we are always paying attention to football and I am happy that Qatar is and will be the face of it for a month during the World Cup, and Qatar will also be the face of the Middle East,” the celebrated footballer added. “We have always been steadfast in our own commitment to ensuring this World Cup is not only about the 28 days of on-pitch action, but about the impact it will have across the Arab world and beyond, for generations to come. I am confident that working alongside someone of Samuel’s calibre, stature and character can only positively help us to achieve these goals together,” Al Thawadi further noted. 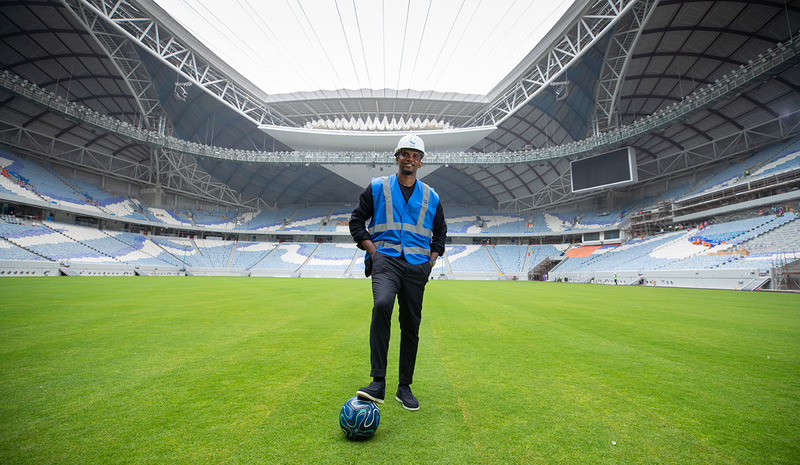 Eto’o will have a particular focus on workers’ welfare projects where he will support the SC in the delivery and implementation of a number of its initiatives, as it continues its work to deliver an outstanding FIFA World Cup. The striker made his first FIFA World Cup performance in 1998 at the age of just 17 years and three months. Apart from football, his focus has also been on humanitarian and social causes leading him to become the United Nations International Children’s Education Fund Goodwill Ambassador for Cameroon in 2017. Earlier in 2006, he also established the Samuel Eto’o Foundation and has since built football schools across Africa to provide access to young people to sporting facilities and to encourage them to practice the sport. The foundation also provides healthcare and social integration opportunities for the attendees. “I told myself I have to share my experience with some, and above all, the grassroots in Cameroon in particular and in Africa in general. I can establish football schools, which will allow some young people to overcome some obstacles, which they might face in Europe,” Eto’o said. “I’m happy because I have some players who now play with some of Europe’s biggest clubs,” he added. What are your thoughts on this news? Share with us in the comments below!